One in 4 parents in the UK now hire a private tutor for their children, an increase of 40% over the last 10 years. GCSE tuition is in particularly high demand, and at Blue Tutors we understand the importance of securing excellent GCSE results. Achieving high GCSE grades allows students the opportunity to take the most sought-after A Level courses, and good GCSE grades play an important part in university applications. Performing well in GCSEs helps to secure your child's future. Whether you have hired tutors in the past, or are new to private tuition, our tutors will work with your child to help them achieve their potential. We have a wide range of tutors who are qualified to teach many different subjects. 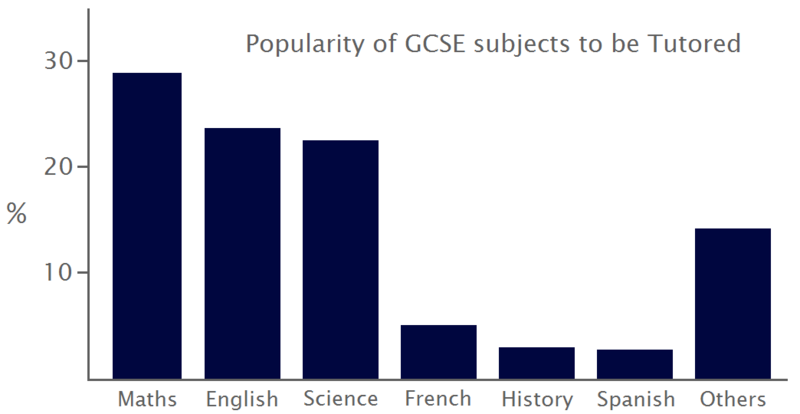 The diagram to the left shows that GCSE Maths Tutors are most commonly requested, but this is closely followed by GCSE English tuition, and tutors for GCSE Science (whether it's double award science or tuition for the single sciences: Biology, Chemistry and Physics). Many of our tutors specialise in these core subjects and have experience tutoring GCSE students who have gone on to achieve top grades. Of course, we can also provide tuition for the range of other GCSE subjects such as French, History, Spanish, Art, Geography and Religious Studies.